So this is my first blog post – a new venture for me. Let me introduce myself. I’m Michaela, mum of 6, wife and teacher and I just love papercrafting. I started stamping about 20 years ago when I was young and had time on my hands. Not many years later I decided (oops, we decided – that’s Mark and I) to start a family. Who would have thought that 6 wonderful children later I have a ‘partially’ grown up family. With 5 boys aged 21, 19, 14, 12, 7 and one young lady 15, I have finally found the ‘time’ to take up my hobby a little more seriously again. Thanks to a wonderful student I taught 6 yrs ago, I came in contact with the most fantastic demonstrator – Debbie and so my obsession with cardmarking was rekindled! And…. I have finally decided to join Stampin’ Up! myself.I recently went to my first demonstrators team meeting and meet a lovely group of enthusiasts, learnt a little about how this all works and then shared the creations that many had made since their last meeting. I have always wanted to be part of a card challenge and Debbie’s challenge for this month is to choose one of two layouts (below) and use any colour and current stamp set to complete this challenge. We were also able to select either a card or scrapbook page or both – if we wished. Playing around I decided on the first design and rotated clockwise. I put my sentiment in the middle square, stamped my two images with a shadow technique, mounted them on the Blackberry Bliss and then realised I had used a retired stamp set. Oh well, I may as well finish it off. Using the Petite Petal stamps, shadow technique and punch, I embellished each with a pearl centre. 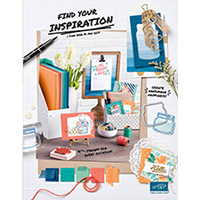 The line of tiny flowers form my band across the card front.I have put the products used that are from the current 2014-2015 “Inspire, Create, Share” catalogue next to the completed card for you. Next blog I will put up the card with a current stamped image on it for you. I’ll try a couple of different colour combinations too! Available online through Stampin’ Up! My website is in its infancy, but you can order directly through me online. This entry was posted in Mum's Posts, Stampin' Up' and tagged Blackberry Bliss, Morning Meadow, Stampin' Up!, Thoughts and Prayers. Bookmark the permalink.